"What is your opinion about reverse mortgages? So many financial planners are pushing this sort of thing, but I heard that fees are steep." Home Equity Conversion Mortgage (HECMs) are the most popular reverse mortgage available. They are federally insured and offer certain borrower protections. Seniors who either own their homes outright or have low mortgage balances can take out reverse mortgages and convert their equity into cash -- either as a lump sum, monthly payment or line of credit, or some combination of the three. There are no income or credit requirements, and the loan has no monthly payment. Instead, the lender pays the homeowner, and the reverse mortgage balance rises as a result, accruing interest and fees. Lenders get repaid when the owner either moves or dies, and the home is sold. HECMs are insured by the Federal Housing Administration, so if for the sale price of the home falls short of the loan amount, FHA pays the lender the difference. "Reverse mortgages are full of pitfalls and they are very expensive -- but they are very valuable to the people for whom they work," says Margot Saunders, at counsel with the NCLC. "If you are sitting on a mortgage and you can afford to make payments on it, and have home equity and other assets, this is probably not a good idea. But if you are 85 years old and have $250 a month in income and a $500,000 house, it's a great idea no matter how much it costs, because the lender will give you money you don't otherwise have." In short, these pricey loans can be a lifeline for low-income seniors. What they aren't is a cost-effective source of cash to buy sports cars or dream vacations, although the industry has aggressively marketed them that way. Lenders have also falsely pitched reverse mortgages as some kind of government benefit program, or part of the economic stimulus plan -- and been sued by states for doing so. Reverse mortgages also come with hefty fees, which can run as high as 5% of your home's value by some estimates. The FHA charges everyone who gets one a mortgage insurance premium fee of either 0.01% or 2% up front, as well as ongoing annual fees. The HECM Saver loan, created in October 2010, has lower fees, but typically higher interest rates and more restrictions on borrowing. Consumers also have to pay a fee up front for third-party counseling to make sure they have a clear understanding of their options. Another pitfall: The NCLC and other groups have documented multiple instances in which seniors were steered unnecessarily into products with higher interest rates and fees by brokers seeking bigger commissions. While HUD capped origination fees, it has done nothing about "yield spread premiums" given to brokers. In addition, Fannie Mae used to buy reverse mortgages from lenders and hold them in its portfolio. But in 2006, reverse mortgages were securitized for the first time, and the resulting securities sold to investors. Since investors like predictable, fixed rates of return, fixed-rate loans have begun dominating the market. That's actually problematic for seniors, because fixed-rate reverse mortgages must be distributed to their borrowers as lump sums. Think about it: You cash out the equity from your home at, say, a 5% interest rate and then invest it -- where? In a savings account earning 1%? You're losing 4% a year. This is where the bad apples in the business bob up: Some brokers try to convince seniors to use the cash to buy insurance policies, annuities and the like. Steer clear of anyone who links the reverse mortgage transaction to a subsequent financial product purchase. Although the Housing and Economic Recovery Act of 2008 banned cross-selling of this kind, it still occurs. If you have access to a simple home equity line of credit or home equity loan, you're better off. 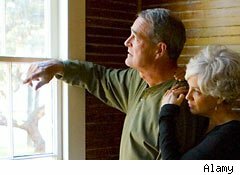 The final problem with reverse mortgages arises when seniors quickly spend the lump sum. Normally, one only pays off the loan when the owner of the house moves or dies, and the home is sold, but a reverse mortgage also comes due if the owner fails to pay property taxes and homeowners insurance, or make necessary repairs. Those situations are occurring more frequently lately, according to the NCLC. So, find a variable-rate reverse mortgage that allows you to draw on the line of credit as needed instead of taking a lump sum, advises Saunders: "Homeowners who take the cash all at once may not have the ability to pay property taxes and insurance later, and HUD is directing lenders to foreclose. The rules should be changed so there is an evaluation of the ongoing ability to pay taxes and insurance, or money should be kept in reserve." Borrowers should also delay getting a reverse mortgage as long as possible in the event they need the money for long-term care, according to the AARP, which offers a host of other recommendations.